Healthcare artificial intelligence is already in use in many health systems in the United States and expected to ramp up in coming years. In 2016, the healthcare sector spent approximately $760 million on artificial intelligence. Over the next six years, the study projects this figure to swell at a rate of approximately 40 percent per year. Thus, in 2024, the total spent on AI in healthcare would be upwards of $10bn. It’s become common knowledge that Americans spend a massive amount of money on healthcare annually. 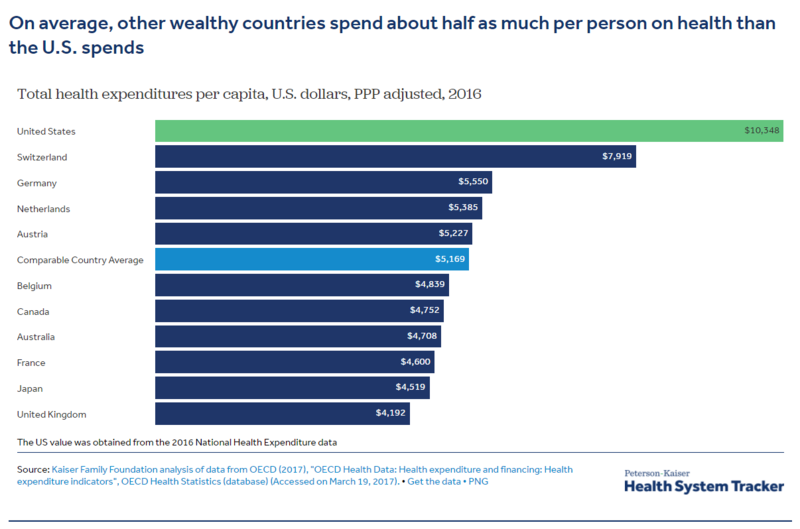 A recent Kaiser Health study looks at this massive spending and provides the following comparison chart that shows how much is spent on average for healthcare in the U.S. compared to healthcare spending in other wealthy nations. The chart above compares how much people spend on healthcare in the United States versus other wealthy countries. Courtesy of Kaiser Family Foundation. Healthcare Finance News points out in an article that AI holds the most promise in healthcare to reduce costs. While AI is already being used in certain areas of medical practice, such as diagnostic imaging, it’s being drastically underutilized in others. One of these areas is population health. The article continues to explain that the overall goal of population health management is to “achieve a baseline of care delivery and quality across certain groups or populations, and once goals have been met, new ones emerge.” Considering the target is ever-moving and changing, population health makes a good candidate for the implementation of machine learning which is able to spot trends and patterns that physicians don’t usually catch. Virtually independent of human involvement, AI in healthcare can make use of EHR along with financial data to identify patient populations with specific characteristics. Preventative and predictive care can be planned more effectively with the smart use of this targeted data. Furthermore, an article in Venture Beat describes how artificial intelligence can help reduce the administrative costs of healthcare. The article cites data from a report by the Journal of American Medical Association (JAMA) that reveals nearly half of all U.S. healthcare expenditures go into the regulating, planning, and managing medical services at the level of administration. Currently, the growth of medical AI is held up by the costly initial investment, maintenance fees, and the fears of large-scale job losses due to industry disruptions. Industry experts that composed the study expressed that the concerns and fears should be outweighed by the general population’s better grasp on technology. Compliance and regulatory issues in regard to advanced AI applications in healthcare are critical as pointed out in an article by Forbes. Considering there is currently not a legal or regulatory framework in place to indemnify software companies and review and approve up-and0coming technologies utilizing AI, which makes it a high-risk investment. The SSI Group is prepared to deliver cutting-edge revenue cycle management software that meets the challenges of the future of healthcare. Request a demo to try out our healthcare IT solutions now to learn more.